The process of obtaining/extension of a permit (license) for employment of foreign workers by legal persons located in Uzbekistan are regulated by the Regulation “ON THE ORDER OF ATTRACTION AND USE OF FOREIGN LABOR FORCE IN THE REPUBLIC OF UZBEKISTAN” download . 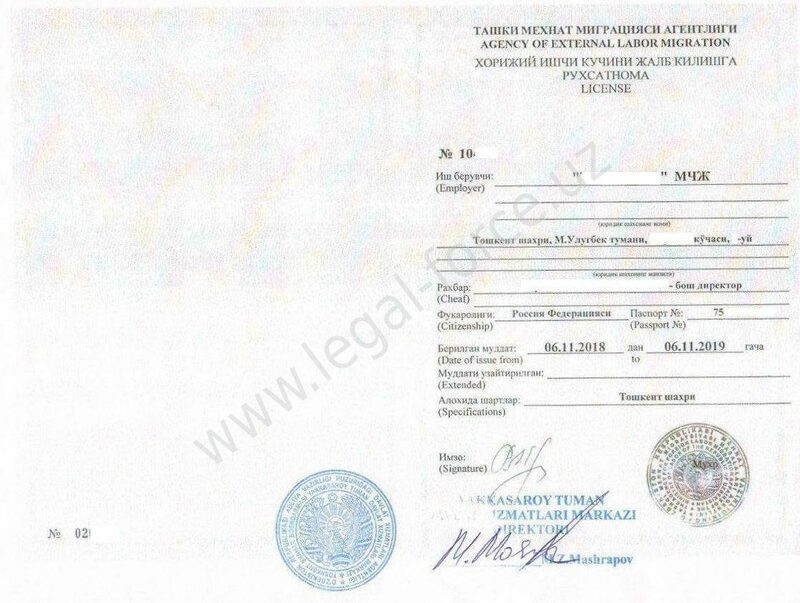 The license is issued by the Agency for External Labor Migration under the Ministry of Employment and Labor Relations of the Republic of Uzbekistan for a period of 1 year. 30 minimum wages for permission (6 081 900 UZS) for activity of the specialist. All the fees need to provide from Bank account of Uzbek enterprise. 7. EDS of uzbek enterprise. 4. A copy of a document confirming the payment (payment order). 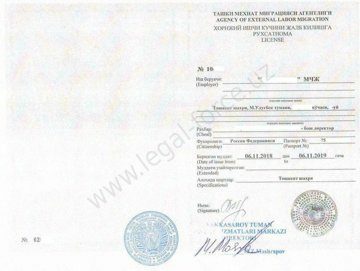 For the prolongation of the previously obtained license, the similar list of documents, accompanied by the original of previously issued license, is required.